Mariel Nader's one-of-a-kind soaps were inspired by the shades and shapes of the 12 birthstones. Celebrate your next birthday with a bit of bubbly! Mariel Nader's one-of-a-kind soaps were inspired by the shades and shapes of the 12 birthstones. Made with only high-quality, pure ingredients and enriched with invigorating minerals, vegetable-based dyes, and soothing vitamin E oil, these lustrous soaps are handcrafted in small batches without the use of molds. 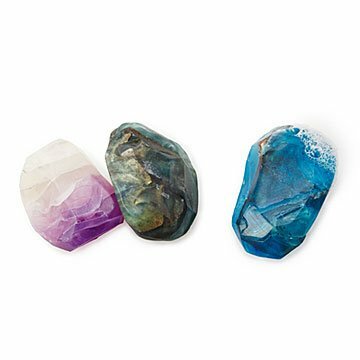 The artist hand-cuts and carves realistic angles and facets into the vibrant soap rocks once they're set in their gemstone-like shapes, giving each one the unique look and feel of an authentic birthstone. Handmade in Connecticut. Read about how maker Mariel Nader stays motivated in a Q&A with her on our blog. Mariel grew up in a very crafty family from Puebla, Mexico and learned many different techniques using various materials, including ceramics, sculpture, jewelry, painting, knitting, masks, candle-making and her favorite craft, soap making. Mariel has a passion for nature, colors and shapes. Very early on she found that minerals, precious and semi-precious stones encompass all these characteristics in a very dynamic way. She moved to the US in 2002 and went to college in CT. Post graduating she traveled around the world for pleasure and also pursuing art courses including one in Florence, Italy where she learned to use different art mediums/technics that later with some imagination she figured out the way to apply into soap crafting using high end cosmetic materials. She decided to embark on a quest for replicating these beautiful gifts of the earth in 2012 and after much research and trials, created these wonderful mineral soaps that represent her passion for nature and craftsmanship. She is now living the dream of working in her creative business from her little studio back in New London, CT.
4" L x 2.5" W x 2" H approx. If meant for display only, recommend to place at room temperature away from humidity (i.e guest bathroom) If meant to be used, recommend to be kept in a soap dish to drain away water after each use to elongate the life of your soap. The January mineral soap stone was much BIGGER than a mineral and clear enough to be able to see all the crystal like effects a mineral has. It is impressive and i wonder if i want to use it or show it off. The color of the soap is spectacular, really nice quality product!! To be honest, I expected this product to be just colored soap but when I got them (3 different months) I was amazed at the clarity and accuracy of them. I bought these for my employees and they were amazed at how unique they were and absolutely beautiful! The soap for December was the first one I opened and it was amazing how real it looked. Good gift for a relative! Impulsive present was huge hit! I've had these soaps before and it's such a pleasure to see as well as use. My BMW saleswoman was thrilled by the surprise! The soap is so unusual, and a fun idea. It might seem a little pricey but it's not for the product. I can't imagine anyone being dissapointed. My Mom loved it so much. Such an unique gift and much more meaningful than a gift card. Love this site. This was a beautiful gift - it looks like a clear gorgeous gemstone from the month that is selected. The fragrance is delicious as you open the package! I was a little concerned with the way it was shipped - in a shrink wrapped bag - but it came out fine. It seems a little pricey but I feel it's worth it and will order again. Truly unique gift for various female members of my family. Glad to have found these.